Adequate thermal insulation is critical to spacecraft operations. 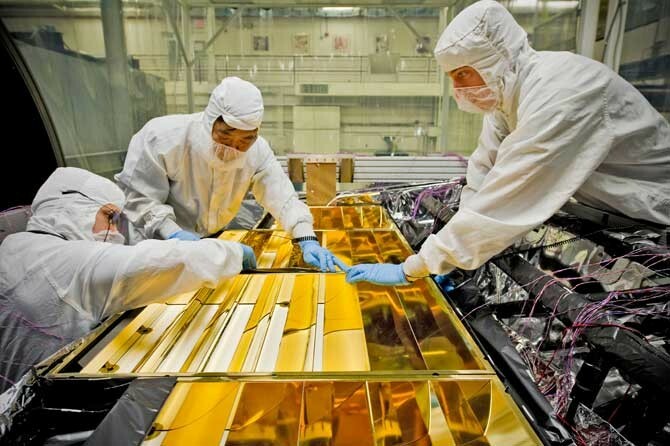 Here, engineers apply insulation blanketing to the James Webb telescope (Credits: NASA). Space’s environmental effects on spacecraft and their components challenge scientists to design and develop materials to cope with, among other things, the extreme thermal environment. The most challenging environment is that around the cryogenic tanks of launch vehicles. Over the past decade NASA has patented two thermal insulation materials which might change the way things are done outside the space industry with respect to cryogenic insulation, particularly in the food storage, transportation, and construction industries. NASA has developed Layered Composite Insulation (LCI) and a composite of polymeric foams and aerogels known as AeroFoam. Currently, LCI is the world record holder for the lowest thermal conductivity insulation system in a soft vacuum environment. Recently, Flexure LLC received exclusive research licences for both these technologies. According to Jeff Kohler who supports NASA Kennedy’s Technology Transfer Office, the license covers application of the technologies independently or in an integrated form for use in the aerospace, military, and commercial industries. Flexure expects the first commercial uses for these technologies to be available in 2013. The X-37B Space Plane: Where is it now?